When you’re throwing a party, and I mean a proper party, you’ve got to wow your guests. Give them an experience they’ll be talking about for months. We’re somewhat biased here at Hire Space as we reckon the best way to thrill your guests is with an amazing location. Location is everything, it sets the mood, getting pulses going with excitement, stoking curiosity or simply charming guests with beauty. Now if it’s excitement you're going for, the ArcelorMittal Orbit Tower is just the place. Stretching 376ft into the sky, this iconic structure of twisting columns offers a place to party for those intrepid enough to reach it. We sent some of the team to check it out, as you can see from their account, the ArcelorMittal Orbit offers quite the experience. At the top of this Olympic monument sits the viewing platform in which events are held. 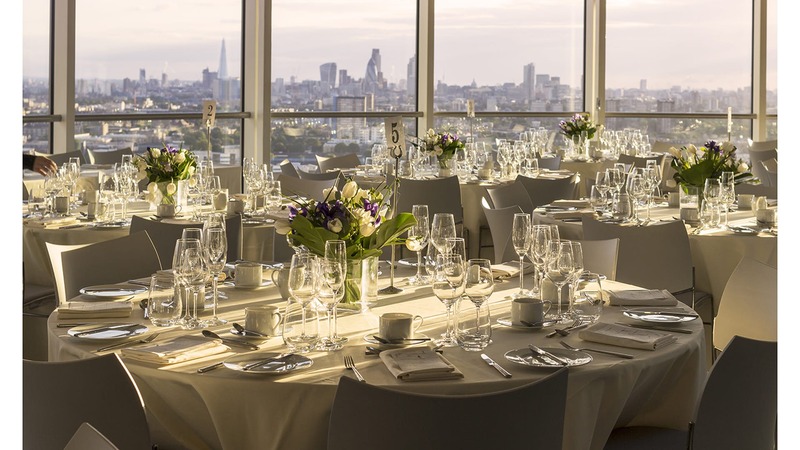 From this lofty nest, events gaze out across the London skyline. In the summer on the best evenings, the city takes on a mesmerising orange glow from the slowly setting sun. In the winter when the evenings are darker, the shimmering lights of the city fan out below, a sparkling backdrop for your party. With space for up to 270 guests for a standing reception, you can host corporate summer parties like no other, combining cocktails with the truly unique sensation that comes with being so high up. If you’d prefer a sit-down dinner that might better suit a Christmas event, the viewing platform can host up to 120 dinner guests for an evening of elevated eating. Most exciting of all isn’t the ascent or even the breathtaking view from the top, it’s the way you can descend. 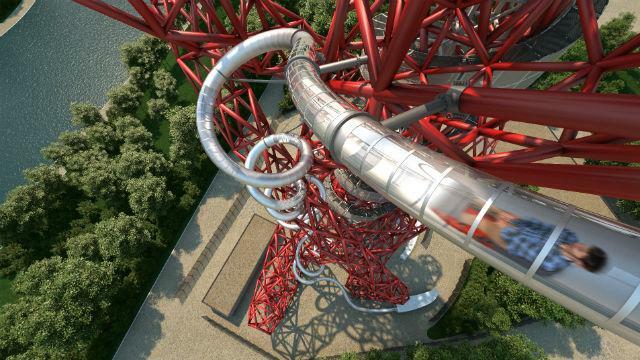 The ArcelorMittal Orbit is home to the world’s tallest and longest tunnel slide. Guests will have the opportunity to ride the thrilling twists and turns of this quirky venue feature, perhaps our only venue in which guests can exit via slide. On your way down you’ll circle the tower 12 times during your 40-second journey to earth. The tight corkscrew section of the slide has earned the name “bettfeder” after the German word for bed spring. 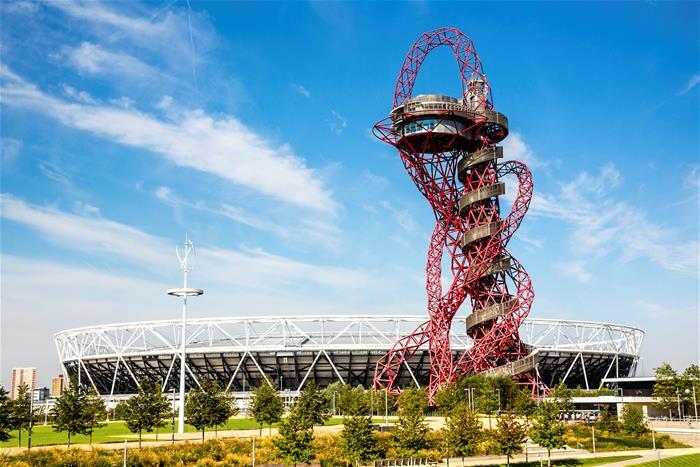 The hair-raising slide was the result of a collaboration between German artist Carsten Höller and Sir Anish Kapoor, designer of the ArcelorMittal Orbit. Beyond the spectacle and excitement, ArcelorMittal Orbit provides a premium event experience for those looking to host their parties and other events there. Their experience event team make creating incredible experiences a breeze as they support you through the process of organising your event. Catering is provided by the Last Drop who offer a range of seasonal menus and drinks from bowl food and canapes to buffets and seated dinners. Give your guests a heavenly experience with a summer or Christmas party like nothing else. Treat them to delicious food, drink and wild entertainment options including amazing acrobatics for a party they’ll never forget.